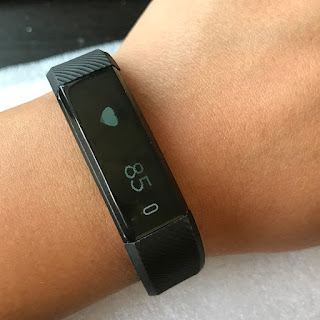 I've recently been in the market for a fitness band for myself, at Christmas I bought my wife a fitness band from China and she's been impressed with it. Looking at the accuracy it's never perfect, sleep and active amounts seem to be out but in the main it works, picks up heartrate, etc, so does the job nicely. All of these fitness bands use BLE which is Bluetooth Low Energy, so they don't have much smarts themselves, they rely on a phone/tablet to sync with and do the main work, but they will store data whilst out of reach and then sync the data back (Seems to be no information on how much/how long it will cope though!). They generally retail around the £30 in the UK (Importing from China you can almost halve that amount, but expect Chinese instructions!). Setting it up is easy, just install the app to your phone - MiFit and let it search and find the band. After that it's pretty much done. 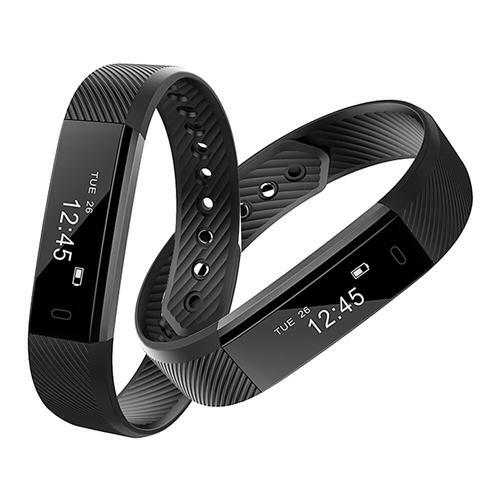 The build of this fitness band is really good, the strap easy to fit and feels secure, and easily fixed. 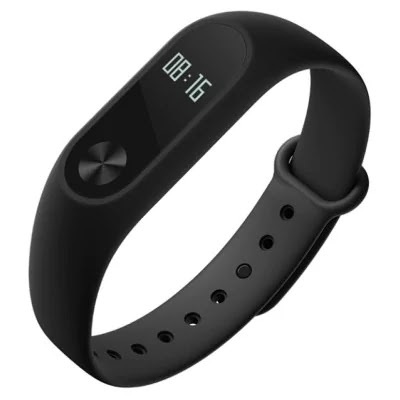 The Miband 2 fits into the strap so it's easily changeable. To charge you remove it from the band and clip it into it's little charger wire, this is probably the worst design feature if I'm being picky as you can lose the charger cable/cradle, and you might not carry it everywhere with you, but this is really minor. The screen is OLED and nice and clear, the finger/touch button then cycles through the different screens showing you: Time, Steps/Pedometer, Heart-Rate. 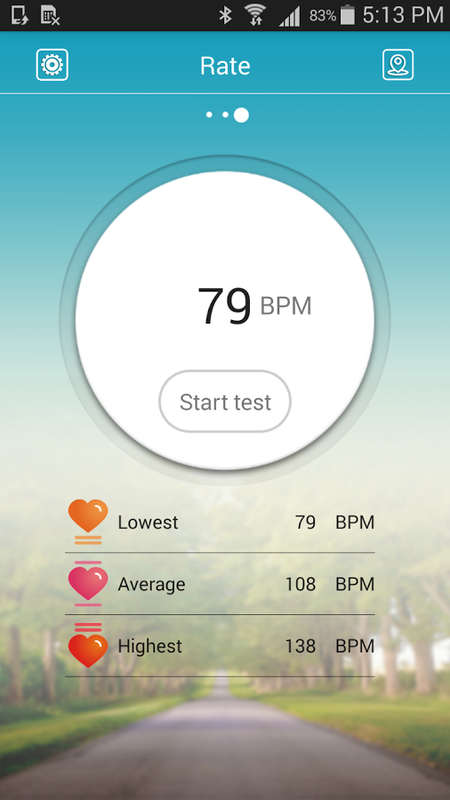 When on Heart-Rate it will start the detection, flashing the cursor on screen whilst it calculates and after a few seconds it displays heart rate. Again a downside here is it only samples once seemingly, so it can mis-read. The unit will also notify you to incoming calls or messages, displaying the number on the screen and vibrating, it doesn't display the message, phonebook of who is calling, so it's more of a notification than being anything more than that. 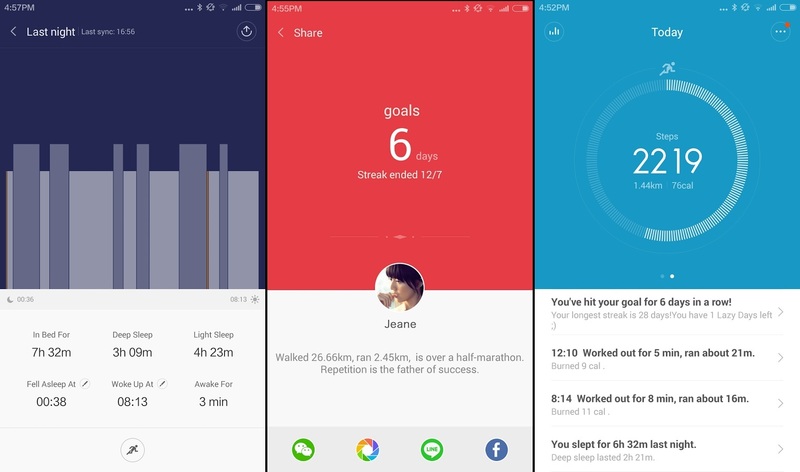 The app MiFit is clear, yet simplistic. You can also change the settings for the band by switching settings on and off, changing units, etc. Notifications can be set on and off here too so you can disable the TXT, phone, etc if you don't need them. 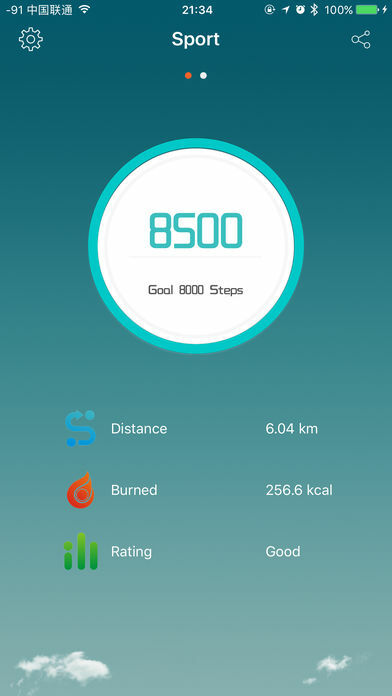 On the main screen you get the steps counter, distance, estimated calories, etc. We took time to go through it and it covers everything you want to view regularly, so in summary it gives you all the basics. It also lets you set (and alert you) to your goals, and map your sleep. 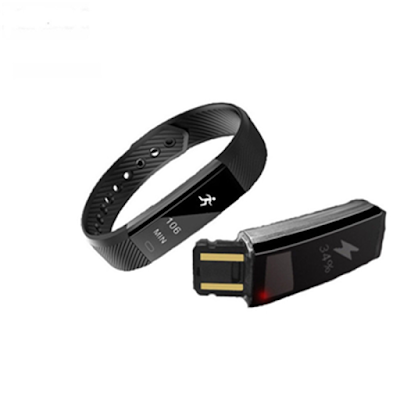 We're unsure how accurate the sleep tracker is though with no frame of reference other than anecdotal! Otherwise this is a very capable band, and one part to note is the amazing battery life. This unit lasts at least a week! That's constant wrist wearing, syncing and looking at the screen occasionally. This is amazing for a gadget these days, lasting this amount of time and really is a superstar feature. 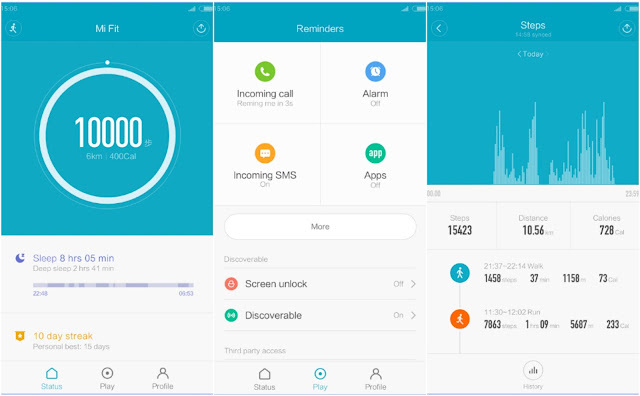 The app you use for this is "DayDay Band" and is again a pseudo-Chinese application, that lets you join the band to your phone, set the band up, setup notifications, etc. By default is shows you your Steps and goals, estimated Calories, etc. 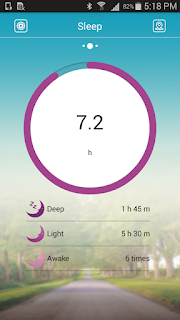 Sleep data on Deep, Light and Awake times, and finally your heart rate results and a BEGIN button to do an immediate detection. In settings you can enable the Lost function, posture reminder, screen time, bright screen and alarm clock. Note that sometimes these settings do crash the application, I'm not sure if this is a buggy application, or means the feature isn't available on my band. 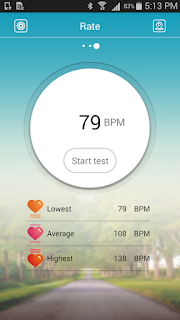 A few settings are interesting, firstly the heart beat option where it will do monitoring every 2 hours, which is an improvement on the other application. It also appears to take several samples of your heart rate and averages them out, I assume this is to avoid false readings as much as possible. It also has the ability to export data to Google Fit, although it's a manual export rather than automatic, but again this works as you'd expect. The downsides to this, firstly the band itself, it uses quite a rigid plastic band with a push-fit to secure. I found it quite difficult to fasten onto my very skinny wrists (using the smallest hole setting), but this is more just awkward, and it never seems to sit fully flush which may affect my heart rate values. This is partly because of the plastic tabs that fasten the band onto the strap, these are solid plastic 'ears' and so don't flex, meaning the band has to lay flat along this part until the strap then bends round. Each end of the band sticks out slightly. It's worse on my wrist which is thinner than that! One advantage is the charging method, you unclip the strap and there is a USB connector built into the plastic, which you just plug straight into a USB connector. Whilst it's not a great fit, so you need to align it and make sure it's not knocked, this does allow you to charge wherever you can find a USB socket which is handy. another disadvantage so far is the battery life. I'm only getting 1-2days out of the band so charging it a lot more than I expected, which of course means I lose data whilst charging. I think this is because I have the periodic heart rate monitor enabled, which uses battery power, and also that when you move your arm around the display lights up. I've yet to be able to display the display lighting up as whenever you go into this setting the app crashes, I need to investigate this a little further which may help the battery life. Still nowhere near the other units amazing battery life. This is probably the one feature that lets this unit down unfortunately. So all in all they are very capable little units, and at the price they are very well priced. So after living with the units for a while now, the biggest issue has appeared from the ID115 band. It's battery life. It gives up after just over a day, takes ages to charge and so is becoming less and less useful as time wears on, I feel it's on charge more than it's on my wrist, so for this instance I'd not recommend it for normal use.